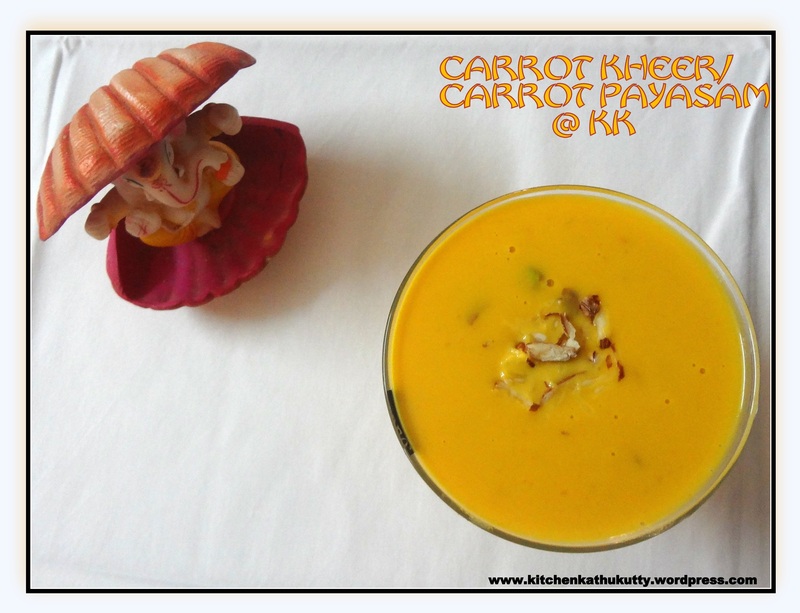 A very quick and easy dessert/snack/sweet/baby meal/festive recipe which is extremely nutritious and 100% tempting you to have more and more is CARROT KHEER/CARROT PAYASAM. I just attempted this recipe for my guests today and I thought if sharing it for Ganesh Chaturthi special. Yet another recipe where I have replaced the whites(milk & white sugar) making it baby friendly and health friendly for the entire family just like my recent ragi milk carrot halwa and daliya kheer . I am providing the recipe with and without white sugar & milk here below.For babies below one year I would suggest you to please choose the recipe without sugar and milk and also avoid saffron & dryfruits. Visit my collection of healthy home made baby foods with few insights on weaning,sample diet chart(6 months to 12 months) here. 1.Wash and peel skin of carrots. 2.Steam cook them after roughly chopping or pressure cook without water. 3.After cooling,add the cooked carrots and powdered sugar/palm sugar to a blender. 4.Make a fine puree of carrot and set it aside. 5.Add saffron to 2 tbsp of lukewarm milk or water. 6.Add 2 tbsp of ghee in a thick bottom pan and roast the dry fruits. 8.Add the remaining ghee and saute the carrot puree in it. 9.When it just begins to boil add the saffron and dry fruits and mix well. 10.Switch off and cool it well. 11.Add milk/coconut milk and serve chilled. You can also add milk when the kheer is on stove top. But be sure to stir well continuously and switch off the gas in two minutes. If you prefer coconut milk,do not add when it is hot . It might curdle. The consistency is purely your choice. Add milk accordingly. But don’t make it too thick or too runny. I saved few dry fruits to garnish. You can also deep freeze to make ice cream/popsicle. I accidentally did it and it was too yummy. You can skip sugar/palm sugar if carrots are sweet in taste and also for babies below 1 year. For babies below 1 year avoid dry fruits and saffron. Coconut milk can be given for babies. If you doubt its usage you can skip or reduce quantity or use diluted version. Have a word with your doctor and consider your family history of allergy. If you using palm sugar,be sure to have powdered and sieved well before use. Always have a word with your pediatrician before introducing a new food to your baby. If you use cow’s milk,use after boiling it well. Prefer a thickened version for babies below one year. 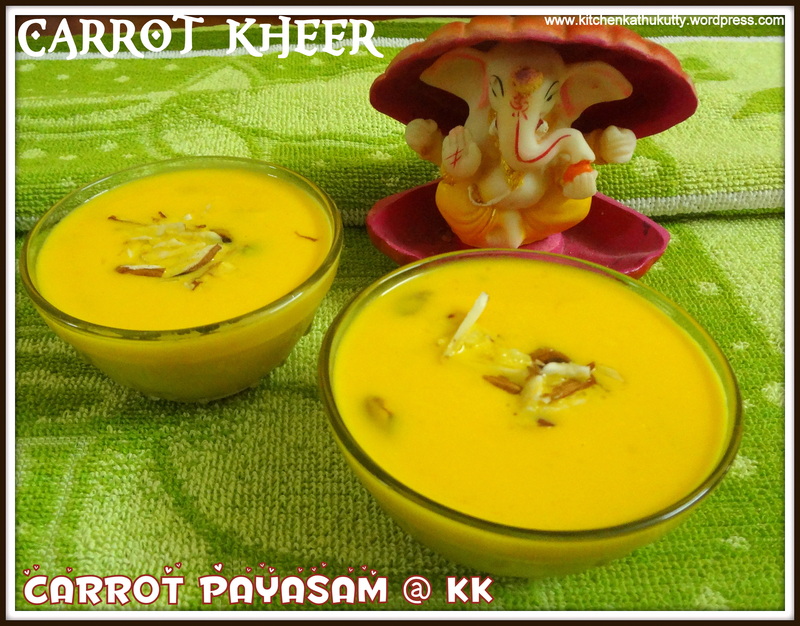 I had used milk for soaking saffron and coconut milk to mix with the kheer in the above images. Do try and let me know the outcome. Please follow my blog at www.kitchenkathukutty.wordpress.com and like my page at www.facebook.com/KitchenKathukutty to receive regular updates.